You can use the substring() method of java.lang.String class to remove the first or last character of String in Java. The substring() method is overloaded and provides a couple of versions which allows you to remove a character from any position in Java. Alternatively, you can convert String to StringBuffer or StringBuilder and then use its remove() method to remove the first or last character. Both StringBuffer and StringBuilder provides a convenient deleteCharAt(int index) method which removes a character from the corresponding index. You can use this method to remove both first and last character from String in Java. In the last article, I have showed you how to get the first and last character from String and today I will teach you how to remove the first and last character of String in Java. Let's see a couple of examples and how you can use these two techniques to solve this problem. 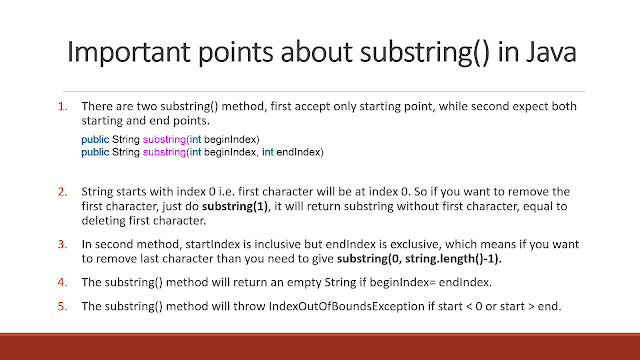 The substring() method is pretty special in Java, at least from interview point of view. Until JDK 1.7, it had a bug which keeps the reference to the original String whenever you ask for a substring. This effectively means if you have a very long String and you just need first character, reference of original String is retained even though it wasn't required. This is known as a memory leak in Java and this prompted questions like how substring() method works in Java. If you are running on JDK 1.6, it's still one of the useful detail to know about. By the way, if you are preparing for Java programming interviews then always make sure that you have a solid understanding of various String concepts e.g. String pool, garbage collection, regular expression etc. 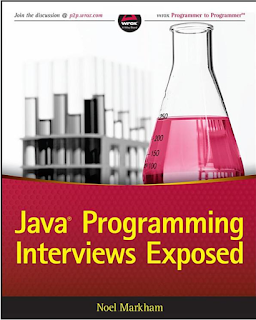 If you are running short of time then referring book like Java Programming Interview exposed can be really beneficial. You will cover lot more topics in very short time, which are critical from interview point of view. The java.lang.String class defines two substring method, substring(int beginIndex) and substring(int beginIndex, int endIndex). The first version will create substring starting from the beginIndex and include all subsequent characters. So, if you want to remove the first character of String, just create a substring from the second character. Since index starts from zero in String, "text".substring(1) is equivalent to deleting the first character. This is exactly what I have done in the first example of our sample program. In order to remove the last character, I have used the second version of substring() method, which takes both a start and end index. An important point to remember is that beginIndex is inclusive but endIndex is the exclusive. The substring begins at the specified beginIndex and extends to the character at index endIndex - 1. Thus, the length of the substring is endIndex-beginIndex. You can also see these 5 examples of the substring to understand how these two substring methods works. Another way to take out the first and last character from String is by using StringBuffer and StringBuilder class. If you remember those classes are added in API to facilitate String manipulation. So, if you are deleting characters from String, the best way is to first convert String to StringBuilder and then use either delete() or deleteCharAt(int index) method to remove characters. You can use deleteCharAt(0) to remove the first character and deleteCharAt(length - 1) to remove the last character from String in Java, as shown in our second example. Here is a sample program to demonstrate how to remove the first and last character from String in Java. This program will explain the approaches we have discussed above. If you have any doubt then check the online Java documentation. // and the last character from String in Java. That's all about how to remove the first character or last character or both from a String in Java. As I said, you can either use substring() method or deleteCharAt() method of StringBuilder/StringBuffer to remove the first or last character. Since String is immutable in Java and cannot be changed or modified once created, substring() method will return new String without first or last character and you need to store the result in a variable before you can use. On the other hand, since StringBuilder and StringBuffer are a mutable object, the character is removed from the object itself. That's why I have used separate StringBuilder instance to demonstrate removing the first character and deleting the last character. You have missed to remove from the letter 'r' from the below statement. Thanks Amit, nice spotting. That statement should remove last character "r" and return "hamburge"
In second paragraph, the deleteCharAt(1) prototype to remove last index is wrong. Please rectify that. deleteCharAt(string.length() - 1 ) to remove the last character..
to be more specific,if the start<0 OR start>end, the exception is "java.lang.StringIndexOutOfBoundsException".